Phi Kappa Sigma was founded by Samuel Brown Wylie Mitchell (pictured left) at the University of Pennsylvania on August 16, 1850. Fascinated by the prospect of fraternal relations with his fellowman, Mitchell set out to found a new, secret order in the restricted life of the university at that time. His papers indicate that on August 16, 1850, he had determined to install a new order on the campus in the fall of 1850. Between August 16 and October 19, 1850, Mitchell sought six other men to constitute the Alpha Chapter of Phi Kappa Sigma. The formal organization of Alpha Chapter occurred at the home of James Bayard Hodge on October 19, 1850. While the official founding date of the Fraternity is August 16, 1850, Phi Kappa Sigma began celebrating "Founder's Day" on October 19 as a commemoration of the establishment of Alpha Chapter. Mitchell, born August 16, 1828, attained a high level of achievement at the University, including earning B.A., M.A., and M.D. degrees. He spent a year as an assistant physician at Philadelphia Hospital and was responsible for supervising the Fraternity's growth at the University of Pennsylvania and the other schools where early chapters were established. Dr. Mitchell practiced medicine until he was commissioned on April 11, 1861, as a Major and Surgeon in the Union Army with the Eighteenth Pennsylvania U.S. Volunteers. He served with distinction until the expiration of his service on January 24, 1865. In March of the same year, Mitchell was made Lieutenant-Colonel U.S.V. for "gallant and meritorious service." Dr. Mitchell was also an outstanding member of the Masons, and an active participant in the professional, social, cultural, and civic life of Philadelphia. James Chamberlain (likely the first pledge of the Alpha Chapter) wrote in 1850, "I remember with profound satisfaction and pleasure the kindly and genial appearance of our founder. A nobler man in ideas, sentiments, and character has rarely lived." In the autumn of 1849, when Samuel Brown Wylie Mitchell matriculated in the sophomore class of the University directly after his graduation from Central High School in Philadelphia, the Delta Phi Fraternity established a chapter at the University of Pennsylvania. During the summer of 1850, a chapter of the Zeta Psi Fraternity established itself on campus. It is probable that the institution of chapters by these two social fraternities at the University of Pennsylvania inspired Mitchell to formulate in his own mind the ideals of a society that would emphasize good fellowship, pursuit of scholarly activities, and qualities of being a gentleman, all combined into a lifelong bond. 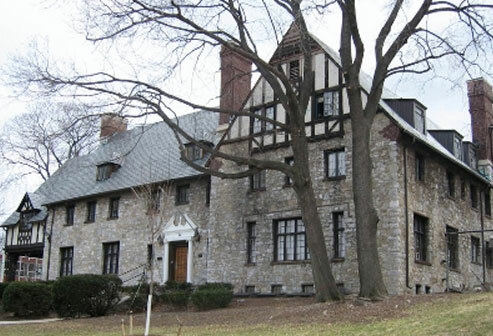 The idea of establishing the Fraternity at the University of Pennsylvania was first recorded in Samuel B.W. Mitchell's personal papers on August 16, 1850, which was also his twenty-second birthday. The date of his birthday, as well as that of the Fraternity, was destined to have a further significance when Dr. Mitchell died on August 16, 1879. When college opened for the fall term of 1850, Samuel B. W. Mitchell had developed the basic principles of the Phi Kappa Sigma Fraternity. These included the Constitution and Ritual, the order's name, and the design of the badge - a Maltese cross supporting the six-pointed star, the letters Phi, Kappa, and Sigma, and the Skull and Bones. No modification, except in size, has ever been made to the badge originally designed by Dr. Mitchell. As soon as the school opened for the autumn session, Mitchell communicated his ideas to Charles Hare Hutchinson. Hutchinson was impressed with Mitchell's ideas and explained them to Alfred Victor du Pont, John Thorne Stone, Andrew Adams Ripka, James Bayard Hodge, and Duane Williams. It was these seven men, with Mitchell serving as their leader, who organized Alpha Chapter and officially founded Phi Kappa Sigma on the l9th of October, 1850. Fraternities were not welcomed by faculties and administrators of many universities prior to the American Civil War. Many chapters were forced to exist sub-rosa or become extinct, as a result of the antagonism evidenced toward social fraternities. Along with other fraternities, Phi Kappa Sigma was banned from the University of Pennsylvania campus in 1852. Dr. Mitchell was called before the Board of Trustees and asked "Why do you wear that 'Piratical' ensign?" His answer was not recorded, but he must have been convincing since the fraternity was allowed to maintain a sub-rosa existence with headquarters in Mitchell's rooms at the Philadelphia Hospital, where he later served as Assistant Physician. While the fraternity operated at the clandestine level, Dr. Mitchell and his fellow brothers established chapters at more receptive institutions. Princeton and Lafayette were added in 1853, and Jefferson (now Washington & Jefferson), Dickinson, Franklin and Marshall, and the University of Virginia were added in 1854. In the mid 1850's, the University of Pennsylvania rescinded its ban on fraternities and in January, 1855, Phi Kappa Sigma was officially recognized by the school. Meetings of the Chapter were held in rented chapter rooms, without dormitory or dining facilities, in various sections of downtown Philadelphia until 1896, when a house was purchased adjacent to the university campus in West Philadelphia. We commit to the value of Trust, the foundation of a relationship based on a belief in oneself as well as others, which is earned and strengthened through experience. The value of trust is found in our reliance on each other and enables an open comfort in interacting with brothers. We commit to the value of Honor, staying true to a set of higher standards and morals in the face of adversity. Membership in Phi Kappa Sigma means a commitment to leading an honorable life. We commit to the value of Respect, which begins with yourself and the practice of the golden rule, "Do unto others as you would have them do unto you." This statement is the acceptance of the ideals of others. In order to move forward as a brotherhood, we must continue to consider each other's viewpoints. We commit to the value of Knowledge, the acquisition of thought, theory and principles following in the footsteps of our founding fathers in accordance with our oath of brotherhood. With this knowledge we will come closer to self-discovery, the improvement of society and the translation of knowledge into power. We commit to the value of Wisdom, a virtue gained through experiences of self and others. Wisdom is the application of knowledge and past experiences to make decisions regardless of the situation. Through sharing wisdom, a bond is formed between young and old, teacher and student; this bond is what brings us together. We commit to the value of Responsibility, by being reliable in the fulfillment of the objectives of our fraternity and our personal obligations, enduring the consequences of our actions. We commit to the value of Integrity, our inner foundation for holding true to our values of trust, honor, respect, knowledge, wisdom, and responsibility that guides us to make the best decisions. As we have seen these values to be critical in the past, they will become even more important in the future!